JMS has been active this last year conducting inclining tests and stability analyses for a range of ship types. Incline tests and stability analyses have been conducted for tugboats, research vessels, and amphibious passenger vessels. In many cases these vessels are older and undergoing a major mid life modification. These older vessels often present various challenges, ranging from unusual hull forms in the case of the DUKWS to a lack of documentation of any kind. It is often necessary to conduct extensive surveys to generate necessary vessel documentation prior to developing computer models of the hulls. JMS engineers perform an ABS or USCG observed inclining test to determine the vessel lightship and center, and use the results to generate the required stability analysis to the satisfaction of the overseeing regulatory body. A recent incline and stability analysis was performed for Henry Marine Service, Inc on the tug YEMITZIS. Henry Marine is a towing company providing general marine services and specializes in towing operations for the construction and petroleum industries and salvage operations. They requested JMS perform an inclining experiment and, based on the results, analyze the vessel’s stability according to the applicable contents within 46 CFR Subpart S. The purpose of the incline analysis and stability assessment was to determine the vessel’s stability characteristics, and to obtain a load line certificate for the vessel. YEMITZIS was built in 1954 by RTC Shipbuilding as a single screw rail tug and had an operational career that ended with the vessel abandoned and in derelict condition. The vessel was rebuilt by Eastern Technical Enterprises Inc. and started its new life in 1992 as a yacht. Henry Marine Service purchased the vessel to use for general marine service and coastal towing. The Yemitzis is a model bow, molded hull form type with characteristic low freeboard, narrow beam and rounded bilge. The inclining was performed in April 2008 at Caddell Dry Dock and Repair, in Staten Island, N.Y. and was observed by ABS. As a result of the incline and stability analysis it was found that the vessel did not pass all of the applicable stability criteria. JMS outlined the implications of the modern stability regulations and what hurdles they present for older towing vessels to pass. JMS provided an action plan to allow the owner to plan for future modifications to the vessel that would aid in bringing it into compliance, permitting the vessel to obtain a load line certificate from the USCG. The specific stability regulations tug and towboats have to meet are 46 CFR § 170.170 (Weather Criteria), 46 CFR § 173.095 (Towline Pull), and 46 CFR § 174.175 (Tugboats and Towboats). The modern stability regulations are in large part a result of accidents that have taken place in the past. This is particularly true in the case of 46 CFR § 173.095 (Towline Pull) which in its current form is a result of the USCG researching the cause of tugboat and towboat accidents that took place between the 50’s and 70’s. The towline pull criteria were modified to the current form in the early 1970’s with the addition of a “dynamic” towline pull criterion. The intention is that towing vessels that conform to the current stability regulations be sufficiently initially stable to resist towline tripping, as well as having enough of a reserve of stability to be able to recover from a tripping incident. This past year JMS continued to provide naval architectural services for Reinauer Transportation Companies in support of their extensive tug fleet modernization program. 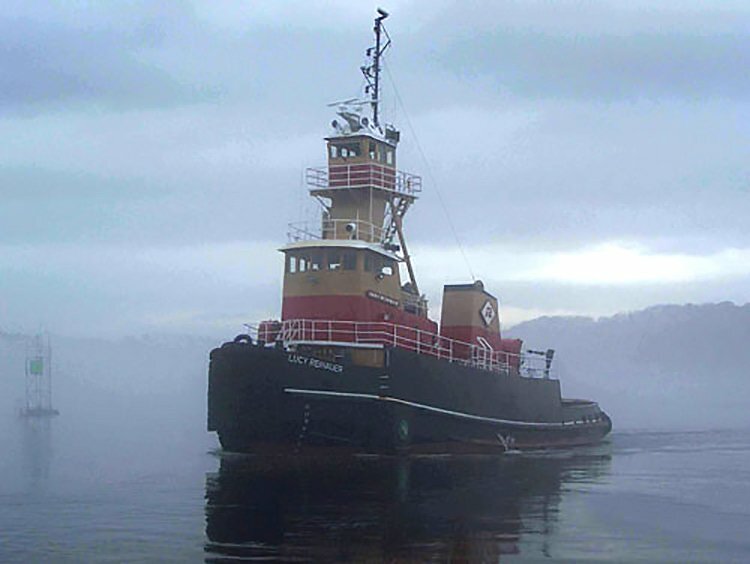 Reinauer has been converting several of its older mid-size hawser tugs to articulated tug and barge units, (ATB’s) at Thomas J Feeney Enterprises in Kingston, N.Y. 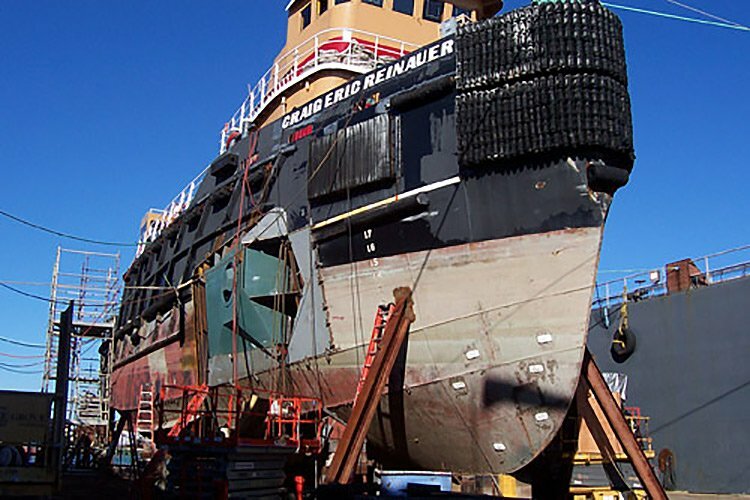 Currently the Craig Eric Reinauer is undergoing a conversion from hawser tug to articulated tug and barge configuration, while simultaneously being repowered, at SENESCO Marine. In the case of the STEPHEN, DACE, JOANNE and LUCY REINAUER, JMS performed initial inclines on the tugs to determine the current lightship weight and center. With this information JMS was able to analyze the impact that fitting the JAK-400 coupler system would have on the tugs’ draft, trim and stability. The tugs undergoing modernization would need to comply with current stability regulations not in force when they were originally designed and built. As previously mentioned in the case of the YEMITZIS, the new regulations are challenging for older tugs to meet and JMS was tasked with providing viable solutions to Reinauer that would permit the tugs to be operated as ATB’s. JMS worked closely with Reinauer, the shipyards and ABS to develop optimal solutions to the unique characteristics of each tug. The solutions included removing downflooding points, adding to reserve buoyancy by increasing deckhouse volume, adding sponsons, reducing tow bitt height, swapping steel superstructure for aluminum, adding solid ballast and increasing tank segregation. Once the vessels were launched and all yard work was near completion JMS performed a final ABS observed inclining of each vessel, to determine the new lightship weight and center. JMS then submitted a final stability analysis after each incline, in accordance with the pertinent stability regulations to ABS. JMS has also continued to provide inclining and stability services to Boston Duck Tours, who operate DUKW tours on the Charles River in Boston, MA. The DUKW’s are 6-wheel drive amphibious vehicles that were originally designed and built to land allied troops on the beaches of Normandy and to permit troops to traverse the flooded Danish country side during the closing days of World War II. In the last year JMS has performed incline tests and stability analyses on three of the DUKWs in service in Boston Duck’s fleet. Because the DUKWs are small passenger vessels they are permitted to use a simplified stability test in lieu of a full inclining and stability analysis. While the simplified test is much less time consuming than the inclining and detailed calculations, it is more conservative. In the case of the COPLEY SQUIRE, a simplified stability test was performed but did not result in the passenger capacity the operator desired. It was found that sufficient margin exists in the simplified stability test method that when a more detailed inclining test was performed, and a lightship weight and center determined, it was possible to increase the number of passengers allowed under the USCG regulations. This will increase revenue through increasing the number of passengers allowing Boston Duck Tours to offset the cost of performing a full incline test and analysis. JMS performed an incline and stability analysis on the LAKE GUARDIAN for Cetacean Marine, Inc as part of a repowering and deckhouse modification project. LAKE GUARDIAN is a research vessel owned by US EPA and operated by Cetacean Marine in the Great Lakes Region. During the fall of 2007, the deckhouse wet lab space was enlarged and the vessel was repowered at Great Lakes Shipyard in Cleveland, Ohio. JMS performed the stability test at the vessel’s home dock in Milwaukee, WI upon completion of the modifications. United States Geological Survey (USGS) contacted JMS to conduct a stability analysis of their 75-foot research vessel, GRAYLING. The R/V GRAYLING was built in 1977 and conducts science-related missions throughout Great Lakes Huron and Michigan. In a previous analysis it was determined that the R/V GRAYLING did not meet USCG weather requirements for operating on the Great Lakes year-round. During this analysis JMS was tasked to determine the feasibility of adding sufficient solid ballast to allow the vessel to meet year-round requirements for Great Lakes service in all modes of operation. In addition to meeting weather criteria, JMS analyzed several other vessel criteria. This included damage stability, righting arm energy and other conditions. To achieve the desired results a new ballast plan was developed. It was recommended that a new ballast tank be created from an existing oversized sewage tank and filled with solid ballast. The recommended form of ballast was a slurry mixture of steel and iron ore that can be pumped into the tank. Once in the tank the water is removed and a dense solid remains. If there is ever a need to remove the ballast it can be returned to a slurry state with high pressure water.